George Emsley shows off the silver medals he won at the World Karate and Kickboxing Championships in Ireland. Young kickboxer George Emsley has returned home from representing England in the World Karate and Kickboxing Championships with two medals after producing a string of impressive displays. 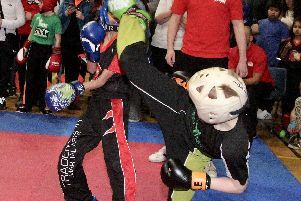 George, aged 12, from Streethouse, showed true world class form in the World Kickboxing and Karate Commission (WKC) event in Ireland, earning two silver medals to top the bronze he won in the event last year. George Emsley with his father Wayne, who was also successful in the World Karate and Kickboxing Championships held in Ireland. The martial arts excellence clearly runs in the family as George’s father, Wayne, was also successful in winning a gold medal at the same championships in the men’s light contact category. George, a year 8 pupil at Crofton High School, won a silver in points fighting, which is a massive achievement as the level is outstanding. His other silver medal came in the light continuous fighting category and George only missed out on the gold by a split decision. The medals come on the back of another successful year for George who achieved his first Dan ( adult ) Black Belt in June. George Emsley with his coach, Hayden Lindley, and his chief instructor, Andy Crittenden. He has been training for eight years, working most evenings at the ACMAC, a martial arts centre run by Andy Crittenden in Balby, Doncaster. George has a wealth of fighting experience, including 22 British titles, six European and two world titles. His Chief Instructor Andy Crittenden said: “George has shown great dedication over the past year in his training towards this year’s world championships. George’s coach is Hayden Lindley, a multi world and European champion. He said: “George is one of the most dedicated self motivated individuals in our team. “His hard work pays off in each and every tournament, even more impressive to say how young he is compared to many other team members. George’s next aim is to qualify for next year’s world championships, which will be held in Niagara, New York, and his family are currently seeking sponsors to help with the cost of the event. Anyone who can help can ring 07932 313242.